The Willow club chair is a whimsical chair that can be used in any room - shown covered in shearling with button detail on inside back with a contrast leather on the outside back and arms - soft foam with feather and down fill in loose seat cushion - on carved wood base and legs with special metal detail on the caps of the legs - finished in dark mahogany. Wood base and legs available in mahogany, walnut or oak. Custom sizes available - priced upon request. 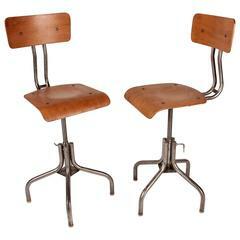 These Industrial chairs are from France and are made from pine wood and metal, circa 1950. 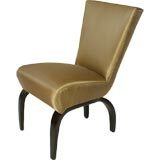 Single Lucite barrel-back chair with shearling upholstery and brass detail. Handcrafted natural rattan chair with iron feet and back. Pink velvet and gold metal feet chair, so trendy, so girly and Art Deco style, around your dressing table, in your boudoir, around the dining table. Such a masterpiece!